The MDEQ publishes full year numbers for hydrocarbon production about 4 to 5 months lagging behind calendar date. That means these 2016 full year numbers are a little late, but better late than never. The good news is 2017 results will be ready in May of this year so full year results for 2017 will be just around the corner. One of the things RMP talked about in October 2016 was Riverside LLC becoming the 2nd largest producer of natural gas in Michigan after Jan-Jun 2016. With full year 2016 results in hand, RMP can certify that Riverside is the #1 natural gas producer in 2016 with 22.7 billion cubic feet of natural gas (or 22% of Michigan’s 101.5 bcf in 2016). Riverside also had the most wastewater to deal with more than any other Michigan operator with 15.4 million barrels of waste water for type II injection disposal wells. In case anyone is interested in the math, 15.4 millions barrels of waste water translates to 648,034,464 gallons of waste water. By adding 2016 natural gas production of 101.5 bcf to RMP’s chart we can boast that RMP has now been Michigan’s #1 watchdog 501(c)3 of the oil & gas industry for 7 years straight. What we see when we look back on 7 years of oil & gas data is steady declines each progressive year. 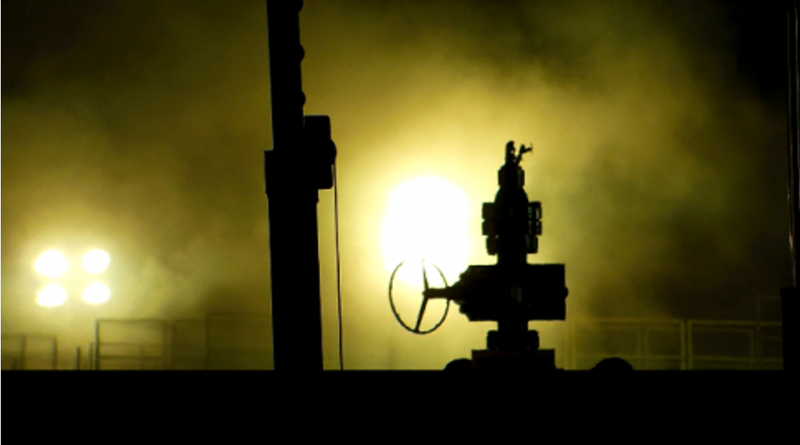 A hydrocarbon industry in decline which means jobs will soon be in decline too. We need to put Michigan’s men & women to work in the next era of hydrocarbons which is waste management and chemical conversion of pig wastes, human sewage, and other biowastes into carbon neutral liquid and gaseous fuels. Follow RMP on twitter by clicking here or like us on facebook to follow our posts on a pollution free and sustainable Hydrogen Economy that puts Michigan’s oil & gas workers back to work on carbon neutral & carbon negative hydrocarbon fuels of the future that cleanse our environment rather than pollute our Great Lakes Basin. The drop in production of 144 bcf in 2010 when RMP started keeping track to just under 102 bcf in 2016 is a 29% drop in aggregate production in steady declines year over year. Even putting vacuums on Michigan wells as we wrote about in August 2016 has not even caused a hiccup in upward production. While natural gas remains a fuel of the future and can still create Michigan jobs for years to come, Michigan needs to embrace the Hydrogen Economy of making natural gas from pig wastes, cow wastes, and human sewage like we see starting at the Port of Long Beach in California. The production graph below tells us Michigan’s massive Antrim Shale is in decline. Now is the time to act to begin to move in a new direction if we want new & clean natural gas jobs that keep our natural gas workers earning a paycheck. Toyota Motor North America (TMNA) is building the world’s first MW-scale molten carbonate fuel cell power generation plant with a hydrogen fueling station, to support its operations at the Port of Long Beach in California. The trigeneration system – supplied by Connecticut-based FuelCell Energy – will use biogas sourced from California agricultural waste to generate electric power, hydrogen, and water. These projects can happen in Michigan too if you support RMP. Will you please make a tax-deductible donation to RMP by clicking here if you can help support us to lead the way toward a clean energy future for Michigan? Toyota has now sold over 3,000 fuel cell powered Mirai’s in California and with this project is demonstrating they can power cars and Class 8 big rigs by making sustained megawatt electricity and over 1.2 tons of high purity hydrogen per day from agricultural wastes like pig poo. In 2016, Michigan produced under 6 million barrels of crude oil. The total aggregate production was 5.4 million barrels. This is the lowest oil production in the 7 years RMP has been following oil & gas data and the first time under 6 million barrels. The top producer in Michigan continues to be Merit Energy out of Dallas, Texas. Merit Energy is the only producer to produce over 1 million barrels of oil with West Bay as the only one close at just under 1 million barrels. Below are the top 10 producers for 2016. 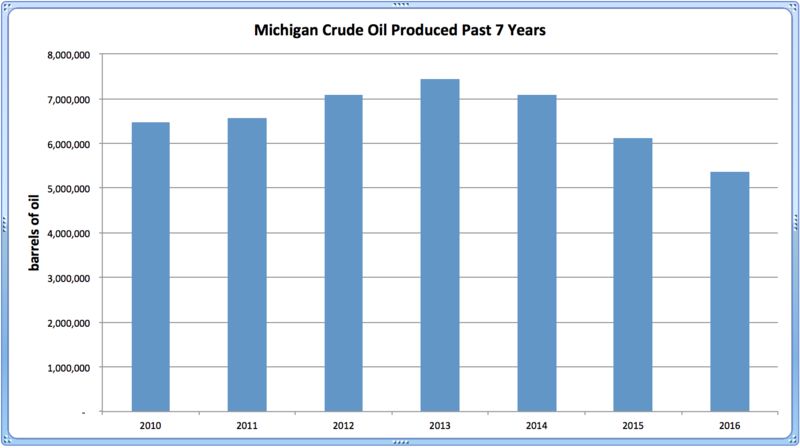 Aggregate production of oil in Michigan over the past 7 years is in decline. So too is waste water production which is a toxic side of oil production. On average in 2016, about 12.6 barrels of toxic waste water were produced for each barrel of crude oil which is also toxic to Michigan’s freshwater resources. Processing this waste water and using Michigan freshwater for secondary recovery is a process that costs operators money and generally creates poor conditions at well sites and waste water disposal sites. 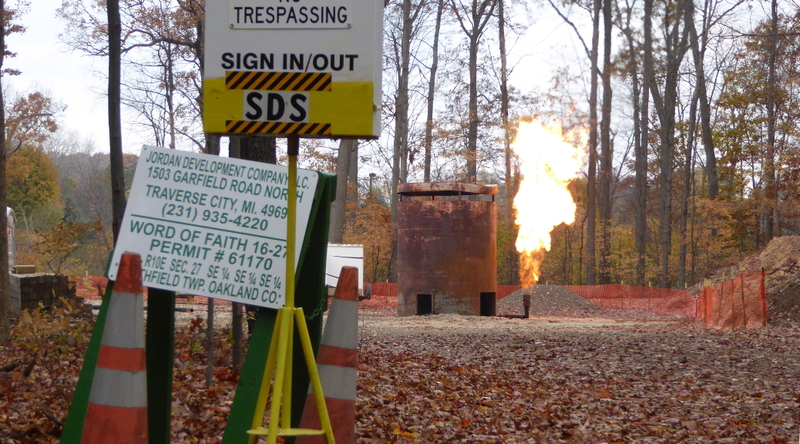 RMP and our volunteers have visited more oil & gas well locations in Michigan than any other 501(c)3 in the state. When we calculate the average ratio of waste water to oil we get 12.6, but some operators have much higher ratios. One operator I would point out is Los Angeles based Breitburn who produced nearly 14 barrels of waste water for every 1 barrel of crude oil. In RMP’s experience, Breitburn wells are some of the poorest conditioned sites on Michigan soil and it is not surprising their waste to oil production ratio is above the average. Some operators have even a higher waste water to oil ratio. Omimex, for example, produces about 35 barrels of waste water for each 1 barrel of oil they produce. The aggregate numbers for 2010 through 2016 oil production are shown below. Natural gas liquids, like all other Michigan hydrocarbons, are in production decline. Merit holds the top spot in Michigan crude as well as Michigan NGLs which is not surprising to those following Michigan oil & gas production. Merit seems to understand how to turn other peoples problem wells into producers. One other notable mention is Marathon in the fifth spot as RMP further demonstrates that High Volume Hydraulic Fracturing is a bust in Michigan. RMP was the first to report that HVHF was over in Michigan and we see Marathon with anemic NGL production from those monster freshwater consumers. Overall NGL production, which spiked in 2013 as Michigan’s HVHF wells in Kalkaska County came online, has quickly petered out as those wells turned out to be duds. 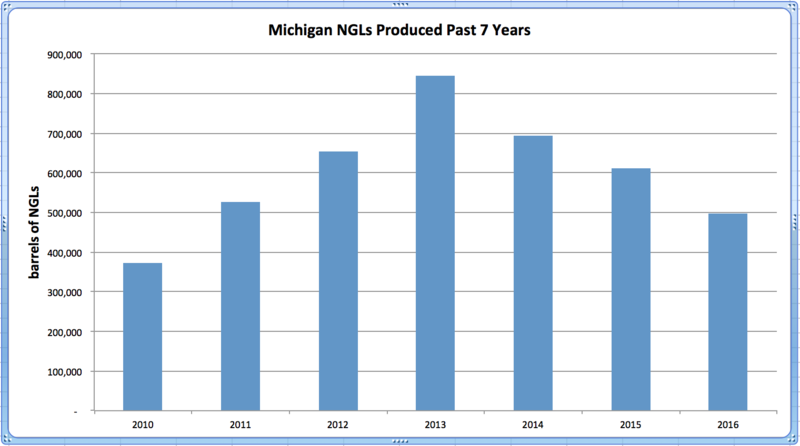 Check out the graph below to see Michigan’s NGL aggregate production in 2016. 2016 Michigan NGL Production. Click image to enlarge. Source: MDEQ. It is easy to see through RMP’s reporting of hydrocarbon production that the Michigan oil & gas industry is in decline. 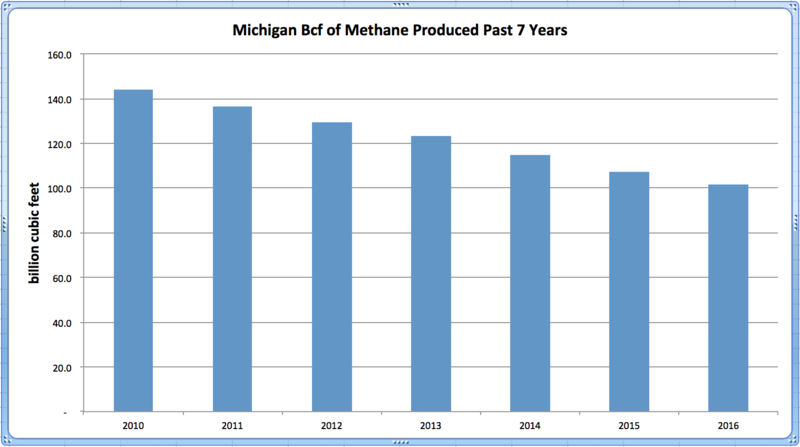 RMP has been a watchdog of Michigan hydrocarbon production for over 7 years now as seen in our graphs. We will actually be publishing our 8th year of annual data in May when 2017 results are ready. RMP supports getting oil & gas workers into new jobs related to hydrocarbon production using surface hydrocarbons like agricultural wastes and human sewage. By using carbon neutral hydrocarbons to make renewable fuels like hydrogen, we can put Michigan oil & gas workers to work in new jobs as traditional oil & gas jobs decline. Consider making a tax deductible donation to RMP by clicking here to help support our mission of supporting common sense environmental stewardship through sustainable hydrocarbon management. Hydrocarbons will always be a part of lives. Let’s use surface hydrocarbons like animal farm waste to create jobs and make carbon neutral and carbon negative fuels like hydrogen. I enjoyed your report. And as someone who’s green-minded, I am glad to see carbon-based energy on the decline in Michigan. Perhaps, as you say, this may eventually lead to more of a focus on hydrogen. What are the main reasons for the decline in carbon extraction? Depleted sources? Less consumer demand? On a separate note, I was disappointed to read the other day that the MDEQ granted Nestle permission to double their production of water from Michigan aquifers. As you probably know, they only pay a $200 fee in exchange for millions of gallons of water that they turn around sell for a huge profit. This makes no sense for Michigan and only further leads me to believe that the DEQ is corrupt and in the pockets of big corporations. It’s truly shameful and disgusting. On a positive note, Matt, thanks for another informative report, and keep up the great work at RMP! It looks like Jordan Development's Word Of Faith 16-27 Niagaran oil well is going to be a long term producer based on the flare stack shown in this post's video. 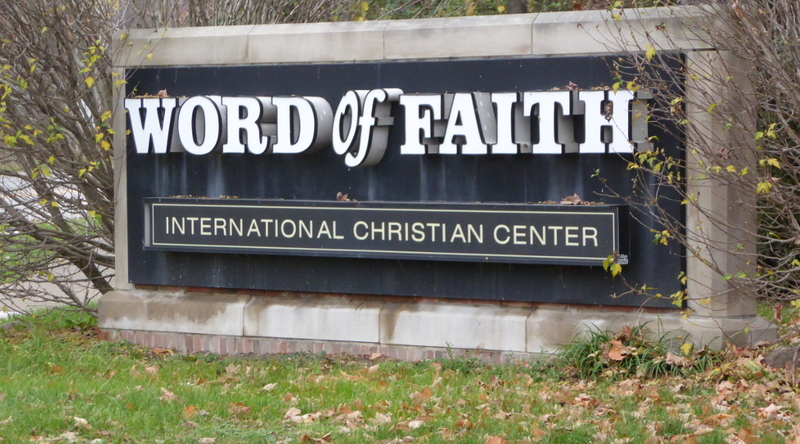 Check it out and stay tuned for RMP's November MOGM where we will explain what Southfield resident's can expect to happen at this location as Jordan Development puts in the necessary infrastructure to produce. The November MOGM will be published November 30, 2016 and we will have more pictures of the well along with our explanation of what will most likely happen next.